Like most of what you find on this site, this story is from one of my books. 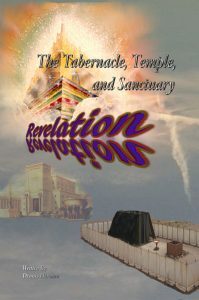 This one is from the series titled, The Tabernacle, Temple, and Heavenly Sanctuary: Revelation. This book takes a verse by verse look at Revelation focusing on the timing, and points out which visions John saw in sequence and which were reviews of the past. In other words, outlining the timing in Revelation. People like to speculate on what New Jerusalem will look like. Some think the city is one building. Other people think the city consists of many buildings. No one knows what the buildings or city will look like. Some artists have drawn up pictures showing a tall, pyramid shaped building with pointed tops. Others show tall, straight skyscraper type buildings. And there is the old favorite, a kingdom looking much like the legendary city, Camelot. What is probably more accurate is, God has designed a city like no other known to this planet. This is a direct link to the eBook offered by the publisher for instant download. When we look back at the previous chapter, we see how Satan and his forces surrounded God’s city, and tried to over throw it. That attempt was made after the rest of the dead were raised to face judgment. When we consider the fact the world laid desolate for a thousand years, we should be able to see, there weren’t a lot of modern weapons left in this world. Ancient armies wouldn’t have been raised with their weapons, so what did Satan’s last army have for weapons? John didn’t give us a time line. We have no idea how much time elapsed between the time the dead were raised, and when Satan gathered his army. It’s doubtful they had enough time to develop and build the modern weapons we see today. They may not have enough time to manufacture ancient weapons. They may have to settle for primitive weapons. In either case, it doesn’t matter if they are armed, they are no match for Jesus. John recorded a rather strange order. Satan and his forces surrounded the city. The entire army is destroyed in the lake of fire. Then John saw New Jerusalem coming down from Heaven to this world. It seems correct to think, the new city will not sit on the earth until all evil is purged. On the other hand, it seems rather strange for Satan to attempt to attack a city hovering in the sky. Everything in this world had to be made new before the New Jerusalem set down on this earth. All the sky, seas, and land was washed from sin just like the Sanctuary was cleansed in Heaven. It seems rather strange to think, out of all the places in the Universe, God chose earth to live. Will God really live and rule from this world, or will this world be Jesus’ home because of His close connection with its people? No other planet in the Universe went through what this world went through, the sin, Jesus being born, taking the life and form of a human, and dying on this planet. It was something no one ever saw before. Not in this world, or the universe. This world will exist as a sort of memorial to the Universe for an eternity. It seems rather strange to see the United States undergoing a sort of change or transformation at this time. Some groups are demanding certain memorials be taken down, claiming they are offensive to their way of life. It is as if the devil is trying to prepare this world to think they can determine what is important to remember, and what can be purged from history. Does Satan know how close he is to the end? Jesus announced that he was going to make everything new. That takes us back to Genesis. Imagine being present to see everything brought back to the way it was in Eden at the very beginning. Jesus said, “It is finished!” But that is only the beginning. Imagine seeing all the plants, flowers, and trees coming up from the ground. Then seeing all the animals recreated. Things will be much different than the world we see today. There won’t be any weeds. Animals will not be attacking, killing, and eating other animals. All of them can be approached, and once again, they will all trust people. Things will all be so different. We won’t have to watch TV to experience nature, we will live it. There won’t be any money. There will be no reason to collect gold and precious gems. None of that will have any value, but to look at and appreciate. Why bother collecting anything, or trying to trade anything when there will be more than enough for everyone. The new world will be so different. Put yourself on the walls of New Jerusalem for a moment. See the plants coming up. 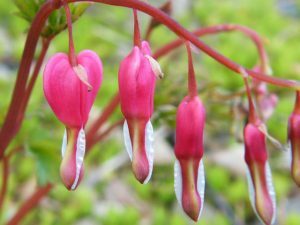 Smell the fragrance as each new plant comes up and each scent mixes. Our senses will be enhanced, and each new scent will be a new experience. Look at the colors. Azaleas are about the most colorful flowers I have ever seen, and they will all pale compared to the vibrant colors Jesus has in store for us. We won’t be able to wait until we can get outside the city and look at sunlight dancing off each pedal, with a slight variation of color in every angle. Our sight will also be enhanced, and Jesus will thrill at every expression He sees on our faces. Best of all, those flowers will never fade. All forms of death with be vanquished forever. Revelation 21:9-27 NLTse (9) Then one of the seven angels who held the seven bowls containing the seven last plagues came and said to me, “Come with me! I will show you the bride, the wife of the Lamb.” (10) So he took me in the Spirit to a great, high mountain, and he showed me the holy city, Jerusalem, descending out of heaven from God. (11) It shone with the glory of God and sparkled like a precious stone–like jasper as clear as crystal. (12) The city wall was broad and high, with twelve gates guarded by twelve angels. And the names of the twelve tribes of Israel were written on the gates. (13) There were three gates on each side–east, north, south, and west. (14) The wall of the city had twelve foundation stones, and on them were written the names of the twelve apostles of the Lamb. (15) The angel who talked to me held in his hand a gold measuring stick to measure the city, its gates, and its wall. (16) When he measured it, he found it was a square, as wide as it was long. In fact, its length and width and height were each 1,400 miles. (17) Then he measured the walls and found them to be 216 feet thick (according to the human standard used by the angel). (18) The wall was made of jasper, and the city was pure gold, as clear as glass. (19) The wall of the city was built on foundation stones inlaid with twelve precious stones: the first was jasper, the second sapphire, the third agate, the fourth emerald, (20) the fifth onyx, the sixth carnelian, the seventh chrysolite, the eighth beryl, the ninth topaz, the tenth chrysoprase, the eleventh jacinth, the twelfth amethyst. (21) The twelve gates were made of pearls–each gate from a single pearl! And the main street was pure gold, as clear as glass. (22) I saw no temple in the city, for the Lord God Almighty and the Lamb are its temple. (23) And the city has no need of sun or moon, for the glory of God illuminates the city, and the Lamb is its light. (24) The nations will walk in its light, and the kings of the world will enter the city in all their glory. (25) Its gates will never be closed at the end of day because there is no night there. (26) And all the nations will bring their glory and honor into the city. (27) Nothing evil will be allowed to enter, nor anyone who practices shameful idolatry and dishonesty–but only those whose names are written in the Lamb’s Book of Life. I’ve seen and heard a lot of debate over this part of the story in Revelation chapter 21. An angel described the New City as a bride prepared for Christ. As we’ve learned from previous chapters in Revelation, all those symbols were designed for angels, and all the angels understand all those symbols. What is marriage to an angel? Is it s commitment, or more? Some parts of the Bible tell us there are no marriages in Heaven. Jesus replied, “Your mistake is that you don’t know the Scriptures, and you don’t know the power of God. For when the dead rise, they will neither marry nor be given in marriage. In this respect they will be like the angels in heaven. (Matthew 22:29-30 NLTse). I’m not sure what arrangements there are in Heaven, or on this world after the saints return from Heaven. Jesus didn’t go into specific details. The fact is, we have to know how the angels viewed marriage to understand the symbol. It is true, Jesus has been committed to this world long before He created it. That’s why the symbol of a commitment makes sense. Many people look at that bride from a worldly aspect. But where does that get us? This world is filled with cheating wives, husbands, and divorces for no reason. The devil drove commitment out of marriage. Why? When we look at the term commitment from a heavenly view, it is forever, an eternity, something few people are able to comprehend. Something we have little chance of explaining. But to angels who only know eternity, and long term commitments, it means much more. The symbol of a bride shows us how angels are committed to knowing Jesus, and sharing Him with this world. The bride shows a closer connection Jesus has with this world, something angels do not fully comprehend, but understand to a degree, and accept. Angels cannot fully comprehend the connection Jesus has with this world based on the fact, none of them turned into human form, came here, lived here, and suffered on this planet like Jesus did. We have something angels don’t, an understanding of suffering. Angels have something we don’t, a much better understanding of God’s plan, and all the symbols involved. In God’s plan, He made humans dependent on angels, and angels dependent on humans. What does it mean, to be taken in the Spirit, with a capital S? Does that mean John met and accepted the Spirit, the Holy Spirit? That’s the way Revelation began. Now John reminds of the fact, this vision, and his book was written through the influence of the Holy Spirit. It was as if the Spirit Himself wanted to show John the Holy City. It was something the Spirit could hardly wait to show John. Seeing the City was a surprise as well as an honor to show John. That makes this message rather special. What is a Christian without a vision, or at least a hope of seeing New Jerusalem? Christians can wallow away their entire lives in this world trying to survive and cope with everything Satan, his agents, and this world can throw at them, without giving a moment of thought to what it will be like living in New Jerusalem. What will it be like? What will life, eternal life be like without a worry in the world? Everything and more will be provided. We will be cared for a lot better than any sheep was cared for in this world. Some of those symbols will tarnish in comparison to what life will be like in the New City Jerusalem. The City was made in Heaven, away from all the influences of this world. Everything will be so different. The materials will be different. The size of the city is like nothing in this world. We won’t have traffic jams, vendors, stores, or anything like that at all. We can walk the streets in complete safety. We won’t see bill boards or any type of advertising. People will be friendly and courteous. It will be like a little bit of Heaven on earth. It seems rather strange to think about the contrast between the first created world and the newly created world. In Eden, it all began with a garden and two people. That was it for years. Of course there were all those animals, birds, fish, and other creatures. Eden was peaceful and tranquil, like nothing in this world. The new earth will begin with a city half the size of the United States coming down from Heaven. The sight must have been something for John to see. His description was brief, but gave us a clue on what to look forward to. Jasper stones can take on many colors, almost any color. Will all the walls be one color, a variety of colors, or will they change color as we walk along those walls? Will they be transparent, semi-transparent, or what? Will we be able to see through those walls into a new world through a different colored lens? Will we be able to see our reflection on those walls? The City has twelve gates. Why would angels have to guard those gates. Are those angels there to welcome us, tell us about the City, and guide all the people through the gates in an orderly fashion. I can see how people may want to stop and linger for a moment before moving along. The city has not one, but twelve gates. Each gate contains the name of each of Jacob’s, or Israel’s sons. There is something about those names and tribes Jesus wants us to remember, and honored them with twelve gates to the City. What does it mean to name each gate after each of Jacob’s sons? There has to be a hidden meaning behind that. The apostles are honored by placing their names on twelve foundations. The entire city is held up by those twelve foundations, which is a very important honor for those apostles. Because the City is home to all the saints who follow Jesus, or know Him from the Old Testament, their life experiences, and they way they lived, all the apostles played an interesting, and very important part of filling that City. Jesus honored one group from the Old Testament, and one from the New Testament. The group from the Old Testament is honored by the gates leading into and out of the City. The apostles from the New Testament are honored by the foundations supporting the City. Without the letters from the apostles, we would have a very difficult time learning what those symbols in the Tabernacle pointed to, and seeing God’s plan of salvation. We need the Old Testament, as well as the New Testament to put that story together. And why not? That story as a whole tells us how and why we are saved. Can you imagine a city 1400 miles square? Last time I drove through Chicago, I looked at my odometer when I got to the tall buildings on the north side of downtown Chicago, and again when I met the end of the tall buildings in Chicago. It was only about a mile and a half. That is nothing compared to 1400 mikes. That has to be a huge city, and gives us an idea how many people will live in that City. A lot!. We may get an idea of being in the Spirit when we look at the size of the city John measured, An average human walks at five miles per hour. 1400 miles would take 280 hours, more than ten days. Imagine how long it would have taken John to measure that city with a rod. Being in the Spirit took on a new measure of space and time for John. Walls 216 feet think are thick enough to contains homes. The average home may be about forty feet long, or wide. If there was one home facing the inside of the City with another facing the outside of the city with windows, each home would be 108 feet long, or wide. The size of the home would be large to say the least. Each home could accommodate a number of very large, spacious rooms. How much gold would it take to cover an entire city as large as New Jerusalem? A lot. I don’t care to guess at how thick that gold is, or how much it weighs, but it has to be more gold than this world contains. What happens to the gold left here on this planet? Will it still exist? Will anyone care? The scene must have been breath taking, all that gold, and no matter what color the jasper was that John saw, it would have accentuated the glimmer of gold. Each foundation stone was a different gem, and a different color. I’ve seen people trying to apply worldly meanings to each of those stones. You know how it is. Someone decided each month should have a birth stone. Then someone decided to apply that theory to the City. Is that right? Will anyone who came down from Heaven inside that City care? Will we be able to see the entire scene of that City descending to earth? Not much of what is written or talked about on earth will matter when we get to actually experience the scene ourselves. All that will matter is the fact, we are there, and all our needs are being met beyond our wildest expectations. John examined those foundations close enough, and with enough care and detail to remember and record each one. Why not? He knew the name each layer represented. John met and labored with each of those apostles. John had a personal interest in those twelve foundations. Imagine how John felt when he saw his name on one of them. But John didn’t point out which one. I guess we have to know enough about John to figure out that question, or wait to get there. Each gate was somehow made out or a pearl. Was each made from a single pearl? They must be rather large pearls for a person, or rows of people to walk through. There is one thing about a pearl. When you look at a pearl in light, especially sunlight, it reflects all the colors of a rainbow, often taking on the effect of multiple, sometimes criss crossing rainbows. Each time we pass through those gates, we will be reminded of God’s first covenant with this world. John adds more details. The streets will be made of gold. The cost of producing new streets, or repairing old streets in the United States is as expensive as gold. Just look at your property tax bill, and all the other taxes added to it. But we won’t have to worry about any taxes. God will have His own way of handling situations like that. And what God does will last forever. I doubt if we will ever see road construction crews in Heaven. How do you get gold as clear as glass? Will the streets be transparent? What will that look like? Like gold, the streets will be reflective. That will be something. Look down, and you’ll see yourself, and all the people around you. Jesus has to have some special way of keeping all those miles of streets clean. Imagine walking over a mirror barefoot. Will we be barefoot? I can’t imagine wearing any artificial, or footwear made from plant materials. And there won’t be any products made from dead animals. All that will be in the distant past. There won’t be any temple in New Jerusalem, no place to meet for religious services. What kind of religious services will there be? Worshiping God will be far different than what it is here. We won’t have committees managing services. Our time with God will not be planned and laid out like it is here. Is the lack of a temple exemplifying that change? God has a group of elders around His throne. There is no mention of those in the New Jerusalem. Will they be there? What will we learn about worship over that thousand year period? How will me worship Jesus as He rules the Universe from His new city on earth? Why earth? Is earth another symbol the Universe understands, but we can’t see because we are so caught up in daily activities and survival? Or are we too busy trying to make the Universe see things from our perspective? That seems to be the common operating mode in this world. Look at a subject in scripture. It can be any subject. How do preachers explain it? They read a verse or two, then break God’s Word down to human understanding, the way the world perceives the subject. Not the way Heaven looks at the subject, but the way the world has been taught to understand the subject at hand. Whatever happened to digging deeper and deeper into scripture to find answers? Whatever happened to waiting on God for the answer? John had trouble understanding some of the scenes. God didn’t send John back to earth to consult with the so called, greater religious minds of this world. God sent an angel with understanding, and different ways of going over the facts, explaining the symbols, and showing John what those visions meant. It took John a while to understand, and another vision in Heaven to finally catch on to what was going to happen to this world. John wrote, “the city has no need of sun or moon, for the glory of God illuminates the city, and the Lamb is its light.” Does that mean we won’t see the sun or moon anymore? Will they also be gone? Or is this another symbol? Other scripture referred to Jesus as the light. The one who is the true light, who gives light to everyone, was coming into the world. He came into the very world he created, but the world didn’t recognize him. He came to his own people, and even they rejected him. But to all who believed him and accepted him, he gave the right to become children of God. They are reborn–not with a physical birth resulting from human passion or plan, but a birth that comes from God. (John 1:9-13 NLTse). John experienced the rejection of that light, and saw how the one he loved was rejected by this world. Jesus came to this world in human form to explain a few things, show people how the Old Testament explained details, and told the world what was about to happen. Jesus sent dozens, maybe hundreds of people back to scripture. Not many of them chose to follow Jesus’ advice, but decided to stick to their own tried and true methods, to look to the world for advice. Worse yet, to lean on their own personal understanding, and explain everything in terms they could understand and relate to. What is that light that is missing? Many people here worshiped the sun. Others worshiped the moon and stars. That was not the light Jesus taught about. He pointed people back to scripture, and back to His Father, and eventually oo the Holy Spirit. A far cry from the sun and moon God created.